Pisces is the last sign in the traditional zodiac, so Pisceans would be natural collectors of “the story so far,” giving them a wisdom that comes from understanding not only the conclusions but also the chain of events. Looking at the symbol of the sign [ )-( ], the separation between “low” and “high” is distinctly marked. This gives the indication that Pisces may seem dreamy to us, but they rarely confuse their own urges with their purpose, and this enables them to be very successful at what they do. The other symbol of the sign, two fish facing in opposite directions, can hint at Pisces’ dislike of head-on confrontations and their readiness to “swim away,” should something come too directly at them. Like other mutable signs, Pisces are quick to change with the currents of the times and to adopt new fashions without too much difficulty. At the same time, they are also quick to pick on any discomfort or illness that is going around. This, combined with the great conductivity that water has, sometimes causes the shifting changes that they feel to be too much, resulting in their need to disappear and replenish their strength for a while, usually in the company of the very stable fixed and/or earth signs, or a loyal circle of relatives and friends. If they cannot find these escapes, Pisceans can suffer from an extreme emotional turbulence that may harm their health. Voyager 2’s findings in 1989 showed that unlike Uranus, which is similar in many ways, Neptune (the ruler of Pisces) has tremendous storms and winds that blow at unbelievable speeds inside its atmosphere, which may tell us what is going on inside the Pisceans, although they usually look pretty quiet and measured on the outside. The old ruler of the sign, Jupiter, gives Pisceans some of the majesty you see with Sagittarians and helps them to carry out anything they would wish to do. 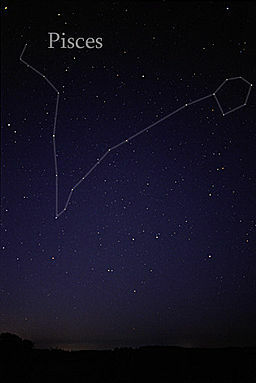 The Roman god of the seas, Neptune, can also add the dimension of depth, with the currents and the creatures that live under the water and never see light, while the trident (♆) indicates the Pisceans’ ability to nail down what they are looking for, often with Virgo’s (opposite sign) sharpness of criticism pointed toward themselves. Combining the element of water with the modality of mutability, Pisceans represent the essence of water, as they are easy to adapt to the shapes around them and are just as easy to lose form when there is no shape, order, or framework. This usually causes them to be even more meticulous (again a “Virgo” word) than others in keeping track, making lists, and repeatedly measuring to see what they have achieved, as they are never sure if they will be able to manifest it again. Water is often considered the source of life, making Pisceans very good agents of causing change in and cleaning others, as well as being refreshing company. Neptune’s moving into its “home” sign Pisces is one of the major shifts we go through in the coming years. For many Pisceans, this would feel as if coming home to their natural element, promising years of feeling better about themselves and their surroundings.